I’m an advocate of our society going cashless and cardless. And apparently, I’m not alone. According to a survey done about Visa Consumer Payment Attitudes in 2016, 74% of Malaysians prefer to make electronic payments instead of cash. Seven in ten Malaysians are willing to use mobile wallets! Green Packet Bhd, a communication and technology services company, saw this big opportunity too when they invested up to RM13 million to penetrate into mobile payments. RM9 million went into securing an 80% stake in fintech firm Webonline Dot Com Sdn Bhd. Part of these funds were used to pilot an app that was branded as Kiple. 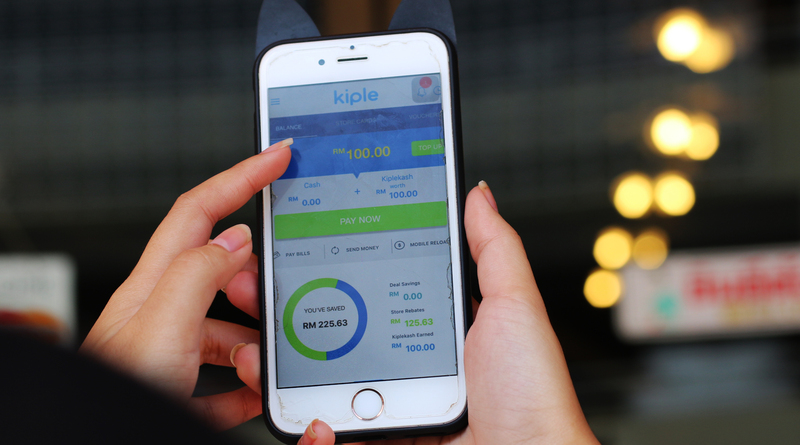 Started in late 2016, Webonline gave birth to a new product which was branded “Kiple” – Kiple (still in its beta phase) was conceptualized to provide an integrated payment solution via their mobile platform. Webonline’s payment gateway system has actually been running for a few years. If you’ve ordered pizza from Domino’s Malaysia or bought a bus ticket from Terminal Bersepadu Selatan online, you’ve actually used Webonline Payment Gateway. Yet to be officially launched, Kiple’s mobile platform has been in development for the past 6 months. Geo-fencing location: You can see the merchants listed on Kiple based on their distance. Peer-to-peer transfer: You can send/receive money through your Kiple account. Pay bills and reload mobile. Rewards: Instant cashback that can be used for the next purchase. Kiple also included a voucher element where you can get deals/offers from the merchants on the app. However, Webonline’s business model is quite different. Most players run on a redemption model where a lot of vouchers may be sold but merchants only get paid for the customers who actually redeem. Webonline currently has about 1,000 outlets on their platform, varying from the food & beverage segment to lifestyle hubs, consisting of health and wellness, and even car grooming services. They’ve gained substantial traction during this beta-testing period with most of their merchants based in specific high-traffic zones. They’re looking at officially launching with a more enhanced version of the app by late October 2017. On August 19, 2017, Webonline brought their first pilot project to life with a brand some of you might be familiar with. They partnered with The Beer Factory Express (TBFX) to power their first cashless bar at Sunway Geo through their unique store card feature. This came after the F&B outlet mentioned they were looking to try a fully digital concept. TBFX already had their own app where customers could enjoy a mobile-first experience. To check out their menu, you’d need the app to scan a QR code on the table before it appears on your phone. Kiple seamlessly integrates the store card feature into the TBFX app. Showing how the QR code appears on the BFX app. So basically you can top-up cash or use your credit cards to top up the store card and make payments through the TBFX app. And this is just one type of collaboration that merchants could do with Kiple. This concept is meaningful for retailers because you’re getting your regular customers to do a prepaid business with you. The entire proposition from Webonline is about digital empowerment to the merchants. While this is only TBFX’s first cashless pub for now, TBFX is planning to roll this system out to their other 50 outlets nationwide. There is a bright future when it comes to mobile payments and how Webonline can play a part in building up this society. A society that’s not just about the big F&B players. There is hope that small hawker stalls, street vendors, those nasi lemak aunties you see every morning, can offer mobile payments to their customers too. You can try out the TBFX app for yourself on Android and iOS devices. This article was written in collaboration with Webonline.